Candle making scent enhancements are natural or artificial additives that are blended with the candle wax to create stronger, longer lasting fragrance. These additives are simple to work with once you've mastered the basic candle making process. Candle makers are always looking for ways to make their products smell great, but it can be frustrating to find the perfect scent only to have it fade quickly. This is especially true when selling your candles, because you'll want a fragrance with staying power in case the candles need to be stored for any length of time. 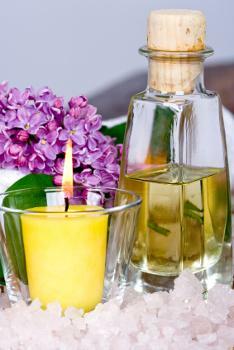 Candle making scent enhancements can provide fragrance stability in all kinds of homemade candles. These products are usually purchased separately, though you may be able to find a candle wax blend that contains one or more additives for improving scent. There is a variety of different additives that you can use to improve the strength and longevity of the fragrance in your candles. They are all available at craft shops, candle making supply stores, or online stores. Fortunately they aren't very expensive, so you can try a wide variety. Vybar is a synthetic polymer compound. It not only holds the scent longer in candles, but also allows you to add up to half an ounce more fragrance to the wax than you would be able to otherwise. 103 - Vybar 103 is used mainly in molded candles because it has a higher melt point. 260 - Vybar 260 has a lower melt point, so it's perfect for container candles. 343 - Vybar 343 is used in mottled candles, which feature different shades of color. An added benefit of Vybar is that it will also produce more vibrant colors in your finished candles. Vybar is a completely synthetic product. Peak Candle Supplies sells both Vybar 103 and 260. Both are available in 8 ounce and 1 pound packages; the 103 is also available in 10 pound packages. Lone Star Candle Supply also sells both Vybar 103 and 260. Both are available in 1 pound packages only. Stearic acid, also known as stearine, is a fatty acid derived from vegetables or tallow. This additive is mostly used to give candles a glossy finish and improve color retention, but it can also help with scent throw. Since stearic acid makes candles harder, it can prolong the burn time and give fragrance more staying power. Stearic acid usually comes in powder form. It is especially useful for soy wax candles, since soy tends to be a softer wax than paraffin. Using vegetable-based stearic acid with soy candles will give you a natural candle free from animal products. Candlewic sells stearic acid in 1 and 5 pound bags, as well as 50 pound cases for those that do a lot of candle making. Volume pricing is also available for those purchasing multiple cases. Lehman's sells stearic acid in much smaller, 8 ounce bags. Their product has gotten five star reviews from consumers, who caution against using too much, as this may cause your candle not to burn properly. Beeswax pellets can be used in paraffin or soy wax candles to give them the unique beeswax scent without the added cost of pure beeswax. They add depth to fragrance blends that use honey or almond notes. Since these pellets are actually a wax product, you don't have to worry too much if you add more than you intended to. They are a great way to add subtle scent to your candles without having to add extra oils. CandleScience sells all natural, cosmetic grade beeswax pellets in 1 and 5 pound bags, as well as 50 pound cases. Their pellets are USP-NF approved. Swans Candles sells both white and yellow all natural beeswax pellets. They sell both products in quantities as small as 1 ounce, up to cases of 55 pounds. If you've decided to try a candle making additive to improve the scent in your candles, here are some tips for the best results. Always read the instructions that come with candle making supplies, including wax additives. Problems can arise if you add too much of these products. Store Vybar and stearic acid in a cool, dry place, making sure that they are in a sealed container or bag. Don't introduce too many different additives to any single batch of melted wax. Try them out one at a time to see which ones work best for you. Enhancements for scented candles can provide a stronger, longer lasting scent without spending a lot of money on extra supplies. Give them a try if you're looking for a way to make highly scented candles.